But Neumann says that a big open question is how good those measurements from space actually are. That’s where the citizen science comes in — to help verify them. Some are more challenging than others. “You can’t really ask a bunch of school kids in Pennsylvania to go to Antarctica to measure the ice sheet height for you for a calibration,” he says. But you can ask them to take their smartphones outside, which is exactly what NASA is doing with its GLOBE Observer app. “You’ve got all sorts of great terrain and features right in your backyard that you could go out and do these measurements that would be useful for us,” Neumann says. After you download the NASA GLOBE Observer app, you can choose from different tools that record cloud observations, mosquito habitats, and the landscape around you. There’s also a new tool for measuring trees, called GLOBE Trees. When you first open it, an earnest tutorial walks you through how to calibrate the app and take the measurements that lets it triangulate tree heights. 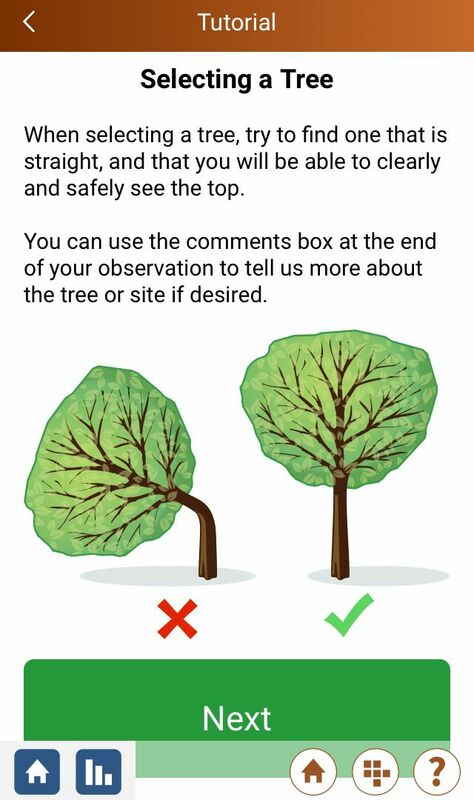 The tutorial includes helpful tips for things like “Selecting a tree” — apparently, bent and broken ones don’t get measured. Once you’ve selected your non-broken tree and staked out a spot about 25 to 75 feet away, you hold the phone right in front of your face and angle it to measure the base and then the tree’s top. Then you take a picture, count your steps to the tree, log your position at its base, and the app spits out the tree’s height. When I tried it, my tree was backlit, surrounded by other trees, and I discovered that, through the camera, its top was hard to distinguish from the top of the tree behind it. Those aren’t ideal conditions for tree measurements, according to the tutorial. Still, the 20-foot height the app popped out seems pretty close to right.